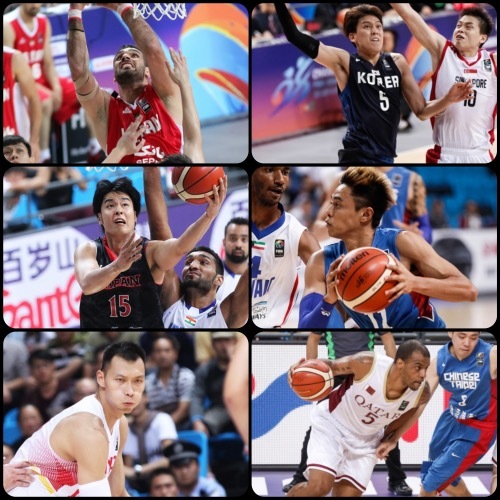 The preliminary round of the 2015 FIBA Asia Championship closed yesterday with three unbeaten teams — Iran, Palestine, and China — leading the way. Gilas Pilipinas also impressed, while Korea, Japan, and Lebanon gained big wins. Iran had no trouble at all in trampling all over Malaysia, 122-42, to complete a Group A sweep in the 2015 FIBA Asia Championship. The defending champs set the tone early, outscoring Malaysia, 35-5, in the first quarter and the game was pretty much over at that point. As expected, the bigger and more experience Iranians dominated proceedings in every possible way. Six Iranians scored in double-figures, led by Mohammad Hassanzadeh’s 28 points. Fellow big man Asghar Kardoust also impressed with 24 points, while Sajjad Mashayekhi and Mahdi Kamrani tallied 14 and 15 points respectively. Coach Paul Advincula’s squad lost their third game in a row and were paced by the combined 27 points of Wei Hong Choo and Chee Kheun Ma. Asghar Kardoust repeatedly bulldozed his way in side for Iran. Yoong Jing Kwaan goes up for an inside stab. Korea returned to the win column after a heartbreaking loss to China yesterday by demolishing Singapore. 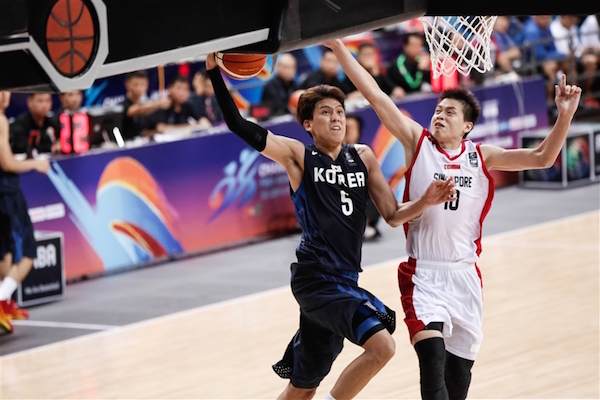 Kim Jong-Kyu and Choi Jun-Yong led the way for the victors, each recording a double-double, while Lee Jung-Hyun and Kang Sang-Jae rattled in 15 and 13 points respectively. Coach Kim chose to rest backcourt stalwarts Yang Dong-Geun, Cho Sung-Min, and Park Chan-Hee, no doubt in preparation for much tougher games in the second round. 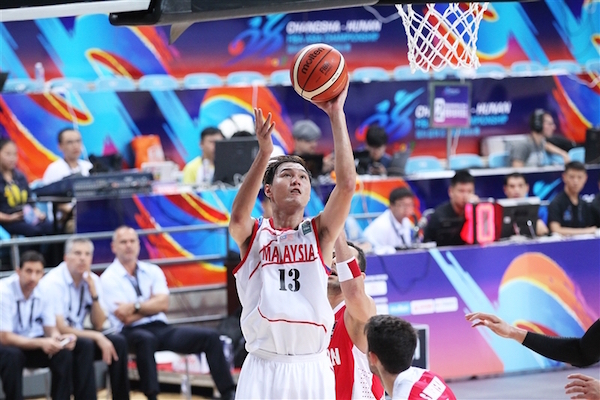 Leon Kwek was the lone Singaporean in double-figures with 12 points, while Delvin Goh put up 8 points on top of 10 rebounds and 2 blocks. Singapore are relegated to the consolation round and can finish no higher than 13th place. Choi Jun-Yong was a playmaking wonder for Korea. Wei Long Wong and the rest of the Singaporeans fall to their third loss. Joji Takeuchi had a wonderful outing as Japan trounced India. The South Asian team had a fast start in this one, erecting an 11-point lead early on and going to the second period up, 18-15. It was all downhill from there, however, as Japan turned up the jets and relied on the smooth combo play of dynamic duo Joji Takeuchi and Makoto Hiejima. Takeuchi led the way with 22 points, while Hiejima added 19 points and 6 assists. Sniper Takatoshi Furukawa drained 3 triples en route to 15 points, while former NBA player Yuta Tabuse also did well with 10 points, 7 rebounds, 8 assists, and 3 steals. 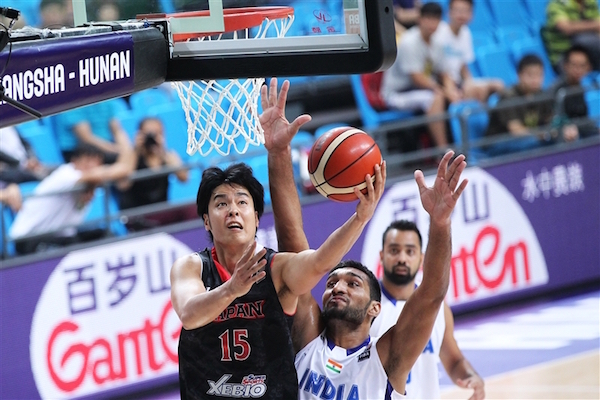 Vishesh Bhriguvanshi paced the losing side with 24 points, while Amjyot Singh and Amrit Pal Singh, both of whom play professionally in Japan, combined to score 29. Joji Takeuchi came up big as Japan gained an important second win. 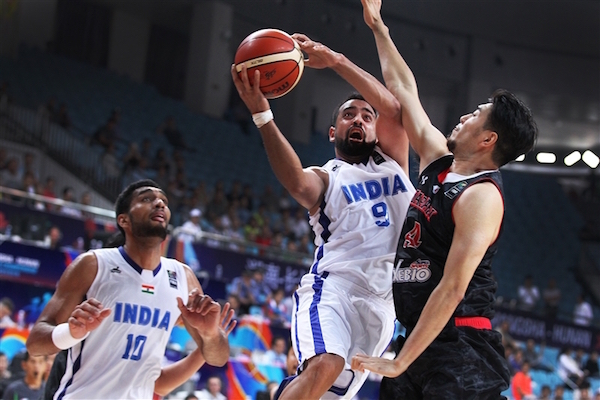 Vishesh Bhriguvanshi attacks the basket hard for India. 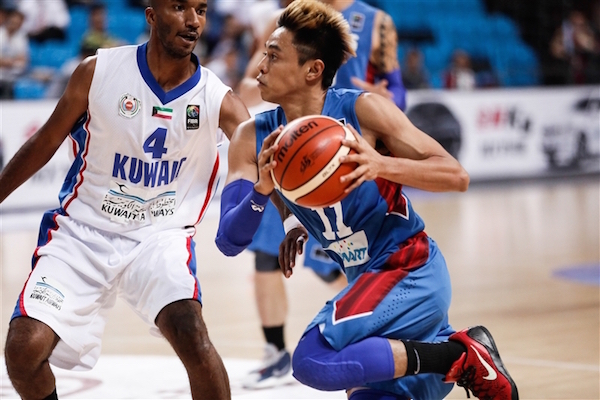 Filipino firepower was in full display as the Philippines blew out Kuwait in group play. Kuwait kept things close early in the game, even trailing by just a solitary point, 11-10, in the middle of the first quarter before coach Tab Baldwin’s wards uncorked a crippling run that all but deflated the Gulf side’s spirits. The Filipinos continued to cruise the rest of the way and secured their ticket to round two, where they are to face Iran, Japan, and India. 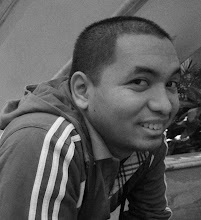 Jayson Castro was the main spark in the first half for the Philippines, and the fiery guard nicknamed “The Blur” finished with 16 points total. 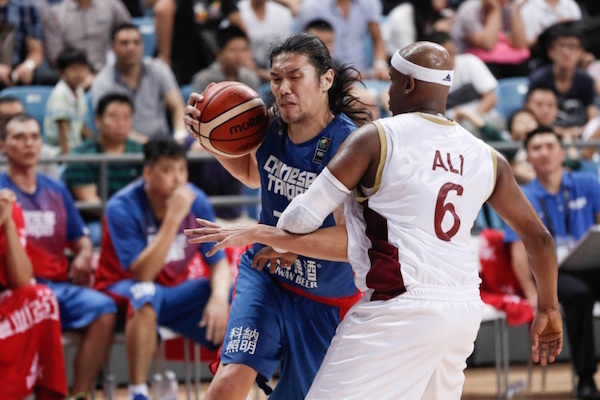 Three other Filipinos broke the double-digit barrier even as 42-year-old Asi Taulava, the tournament’s oldest player, recorded a near-double-double with 9 points and 10 rebounds. Terrence Romeo unloaded his best game yet, hitting all three of his attempts from beyond the arc to finish with 19 points. Kuwait couldn’t do much to match the Filipinos’ fluid offense, but they did have a few players impress. 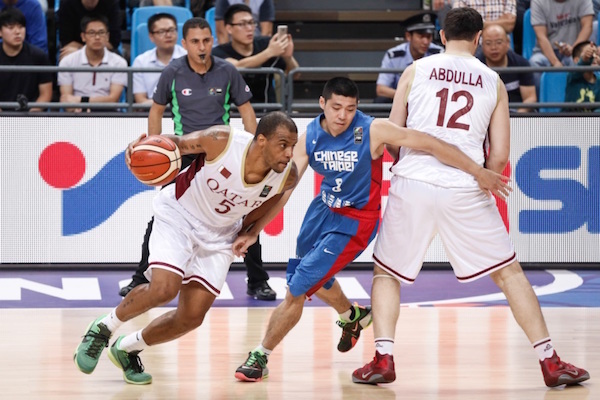 Abdularhman Al-Shammari and Abdullah Al-Saeid dropped 15 and 13 points respectively. Abdulrahman Al-Juma'h reacts to what he thinks was a bum call. Terrence Romeo broke out in a big way for Gilas Pilipinas. China wrapped up first place in Group C with a victory over Jordan. Twenty-four hours after their come-from-behind triumph over Korea, the Chinese broke open a tight game late in the first half and stormed to the win. 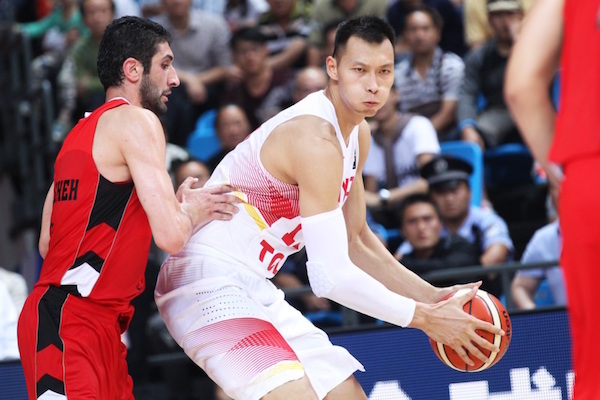 Yi Jianlian, who had 26 points and 14 rebounds, turned on the style with his best performance for China while Zaid Abbas finished with 22 points in defeat. China completed a 3-0 sweep of Group C to take first place, a real confidence-booster for a team that has young and emerging talent while Jordan, whose Zaid Abbas picked up his fourth foul early in the third quarter, at least have the consolation of knowing that they played extremely hard and kept the game tight for 20 minutes. Sam Daghlas struggles to get by Guo Ailun in their Group C match. Yi Jianlian led the way in China's third straight win. Palestine survived a late rally by Hong Kong to cement their place as the top team in Group B. Once again, coach Jerry Steele played his top three guys for the entire game as they could not afford a loss at this stage. Sani Sakakini, as usual, was brilliant with 19 points, 16 rebounds, and 8 assists, while Imad Qahwash and Jamal Abu-Shamala added 24 and 22 points respectively. 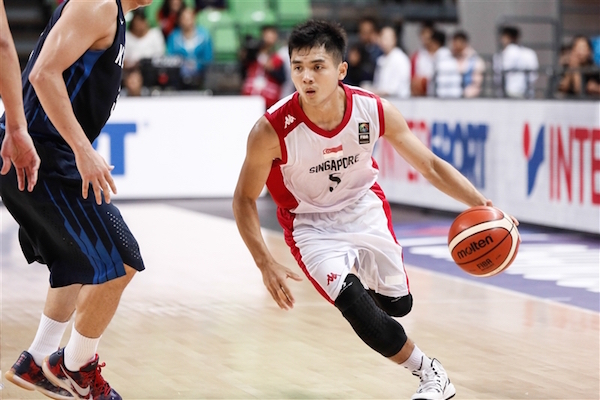 Hong Kong was led by its two best shooters, Lee Ki and Chan Siu Wing, who scored 26 and 22 points respectively. Hong Kong finishes third in the group and also moves on to round two. 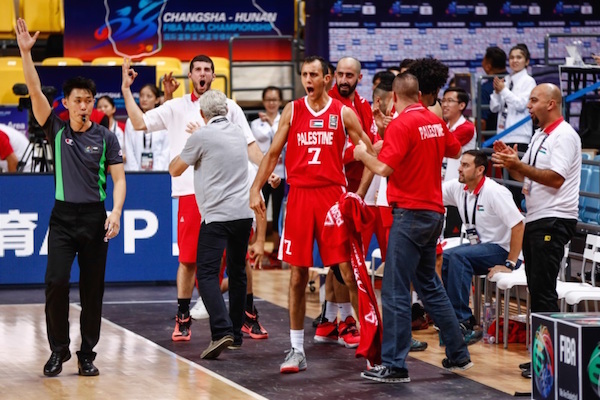 Palestine rejoices after sweeping Group B.
Chinese Taipei suffered nothing but frustration on the first two days of the FIBA Asia Championship with narrow defeats to Lebanon and Kazakhstan, results that eliminated them from contention for a spot in the next round. On Friday, the team played for pride and rebounded with a victory over previously unbeaten Qatar, a team that had already clinched first place in Group D. Lin Chih-Chieh scored 14 points and Quincy Davis had 13 points and 10 rebounds for the winners, who will now set out to impress in the Classification Round and finish as high as possible in the standings. Trey Johnson and the rest of Qatar fell short of sweeping Group D.
Tseng Wen-Ting and the rest of Taiwan tumble to the consolation round despite beating Qatar. 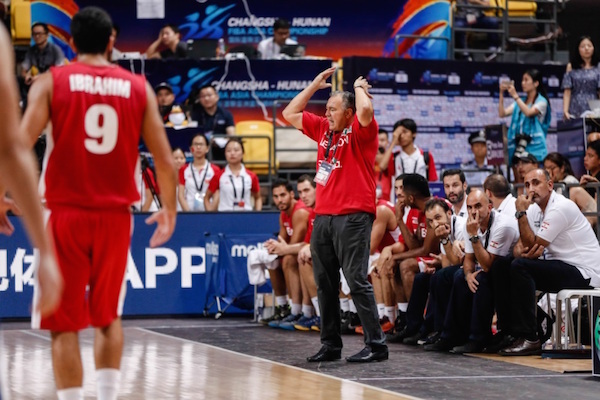 Lebanon suffered double-overtime agony on Thursday against Qatar but 24 hours is a long time in basketball and they proved it by rolling over Kazakhstan on Friday night. Jasmon Youngblood had 30 points and eight rebounds to lead the Lebanese, who took command of the game when they outscored Kazakhstan, 26-8, in the second quarter and took a 41-24 lead to half-time. 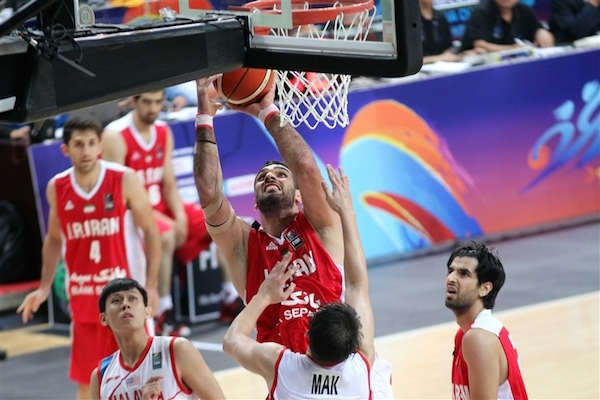 Kazakhstan led 16-15 at the end of the first quarter but Lebanon turned the game on its head in the next frame when restricting their opponents to just eight points. The decision to rest Kazakhstan guard Jerry Johnson for the majority of the game because of a minor muscle strain he picked up on Thursday also hurt their cause. Jay Youngblood was 12 of 18 from the floor and three of five from behind the arc for Lebanon, who finished second in Group D behind Qatar and ahead of Kazakhstan. Coach Veselin Matic is a picture of emotion on the sidelines for Lebanon.